Your Mac contains thousands of hidden files and folders that you'll probably never need to access. 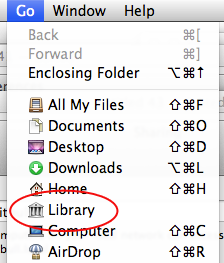 We explained how to access all hidden files and folders in another tutorial, but there's an easier way to access one of most important hidden folders on your Mac, called the Library folder. The user's Library folder, which is different than the root Library folder at the top-level of the hard drive, contains hundreds files that store important preferences and settings for many of the applications on your Mac. It's good to learn how to access this folder, even if you don't need to open it right now. Press and hold down the Option key on the keyboard. From the Go menu, select Library, as shown below. The Library folder will open. A word of warning: Think twice before editing the files in the OS X Library folder. These files are used by the applications on your Mac, and modifying them could change how the applications work. However, it doesn't hurt to explore the Library folder and see where some of the most essential files on your Mac are stored.